Wall-Mounted to Freestanding. Indoor to Outdoor. Whether your goals are advertising, POS video, internal communications or wayfinding, digital signage is an extremely effective method of engaging with your audience. Unlike traditional signage, digital signage can also be updated at the touch of button, with a central control system able to remotely update the content across a network of screens. Typical uses include personalised welcome signs in office facilities, digital poster displays in retail centers, patient info videos in healthcare organisations, video advertising in car showrooms – there really are no limits to how the technology can be used. Make a statement. 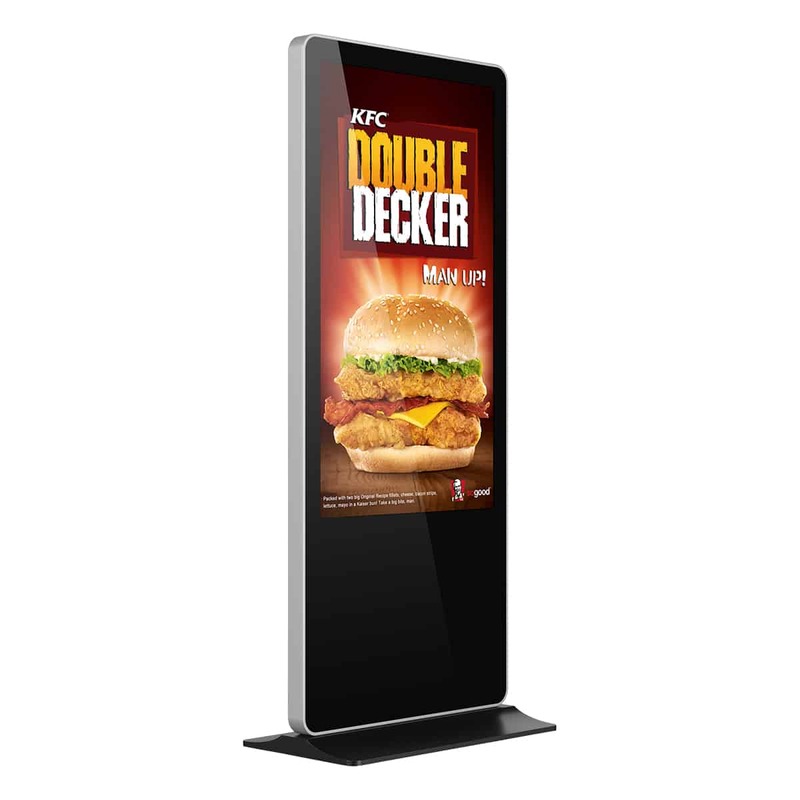 Digital poster displays are designed to put your promotions front and centre. You provide the message, we provide the medium, and your audience will do the rest. Prices start from just £340 (ex. VAT). Catch the eye. Freestanding Displays are the stylish way to make ads and promotions come to life. They’re totally freestanding so you can put them wherever they’ll create the biggest impact. Prices start from £980 (ex. VAT). Make an impact. Multimedia Kiosks make information accessible, graphical and fun. Instead of catering to every visitor at once, you sometimes need to give some time to the individual. Giving users access to information and advice has never been easier for you, or more intuitive for them. Prices start from £1,750 (ex. VAT). Get your message across. On any site and in any weather, Outdoor Poster Displays reach out to where your customers are. These are robust weather-proof screens that are as breathtaking as your customers have ever seen. Prices start from £3,750 (ex. VAT). Wow your audience. Information on hand where and when they want it. Freestanding means free rein to catch their eye. No limits on where you can put them; Outdoor Displays work perfectly in all weathers. Prices start from just £4,500 (ex. VAT). We start by getting a thorough understanding of your needs. Not just the big things like price and product specification, but all the things that are just as critical but harder to convey. Time to get creative… We combine our expertise in design and technology to create a display piece that will attract and engage. From slick videos to slideshows to custom apps, our interactive design team will create rich content to bring potential customers right up to your display. We can handle any size of manufacturing run. And everything is rigorously quality checked before we ship your product. Add your branding, logo & design. We can accommodate for the addition of branding on all digital signage products. Despite the fact that all products come in standard finish and colours we can apply simple logo graphics or ever more comprehensive full wraps with different colour vinyl to match your corporate identity and branding.